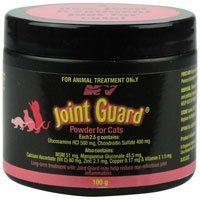 Joint Guard is a nutritional supplement containing natural ingredients which are clinically proven to support joint health in cats. With Glucosamine, Chondroitin, Vitamin C, MSM and other ingredients in a specific proportion, the powder proves beneficial for osteoarthritis and other degenerative joint diseases found in cats. Glucosamine Hydrochloride helps in building cartilage and also repairs damaged cartilage cells. Chondroitin Sulfate prevents the arthritic enzyme from destroying the cartilage cells. Another highly effective nutrient included in Joint Guard is MSM with natural anti-inflammatory property eases the arthritis pain. Vitamins and minerals maintain healthy bone and cartilage in cats. My young kitty showed signs of joint problems and she's been on Joint Guard for about 2 months now! I can see noticeable improvement in my dog's movement and energy levels. Great product! Reasonable price! My old Staffie had pain in his joints and was limping badly. Since I have started giving this stuff to him there is no pain and he even stopped limping. This is a fantastic product. Solves a lot of pain issues in joints in my ageing pet and it also helped improve mobility.